We offer luxury, five-star, hotel-style retirement living in a picturesque Oxfordshire location on the banks of the River Thames, all the ingredients for residents to enjoy a fulfilling, relaxing life. Don’t take our word for it though. 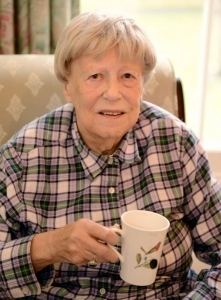 We caught up with Mrs Monica Randall, 92, who moved to Thamesfield in 2015. Here Monica tells her story and explains what she likes about our retirement community. How did you come to the decision to move to a retirement village? My husband and I were getting older and living in a five-bedroom house, which we no longer required with the children grown up and no longer living with us. We thought about coming to a retirement village and visited Thamesfield to have a look round, but before we could make the move my husband sadly passed away. I was left on my own in a large house. This solidified my decision to come to the village. What were your impressions of Thamesfield and how did it compare to other retirement villages? My first impression of Thamesfield was that it was a very well run retirement community. I looked at two other retirement villages but Thamesfield was more attractive and seemed better run. Plus it was close to my son, who lives in the area and visits me at weekends. I bought a one-bedroom apartment, which offers a lovely view of the river. I am happy here but it is very different without my husband. However, I have made new friends including a nice lady who recently moved into an apartment near me. I love the position of Henley on the River Thames. The river is very busy, with lots of boats coming and going, which means there is always something to look at. Do you get involved in Thamesfield’s social scene? I take part in the quizzes, afternoon tea and cocktail hours organised at Thamesfield. There is a large selection of drinks to choose from and the chefs produce some delicious canapés. I also go on boat trips up the river, which is very enjoyable. My son is the president of the Leander Club, which was founded in 1818 and is one of the oldest rowing clubs in the world. How do you rate the services provided at Thamesfield? The services at Thamesfield are excellent; all the Thamesfield employees are so friendly and supportive. I now have a free hour of cleaning a week and a laundry service. The staff responsible have been extremely helpful. I also make use of the hairdresser and beautician (I have my nails manicured).